On a recent trip to Vancouver, a friend gave me a book. He knows I’m not a big reader, so it seemed like an odd gift. The book is called “Sandwich Exotica : The Sandwich Manual for Connoisseurs” – and it’s already my favourite book in the world. Published in 1975, it claims to be a transcription of a book food in an antique shop in Pennsylvania. According to the author, the original book was published in 1939 under the title “Sandwich Manual for Professionals” and it’s believed it was intended as a menu guide for restauranteurs and chefs. At the back it even has a Sandwich Cost Table which would have been out of date when this book was published 40 years ago and is now nonsense. It starts with an origin of sandwiches which it claims started with the Greeks and Romans enjoying “a wedge of meat between two slabs of bread.” It goes on to do’s and don’ts of making sandwiches (…in placing meat or meats on spread, be sure all four corners are covered..), sandwich garnishings (a section which starts to describe a sandwich as a woman, and the garnish as her accessories and makeup), and then gets right into potential sandwiches. Altogether there are about 600 types of sandwiches in this book and I’ve been having a hell of a time on twitter asking people to pick a random number and I will tell them what kind of sandwich they are. In my mind, it’s a good sign that the first sandwich in the book is a bacon and tomato sandwich (with lettuce). I’m a huge fan of the BLT. 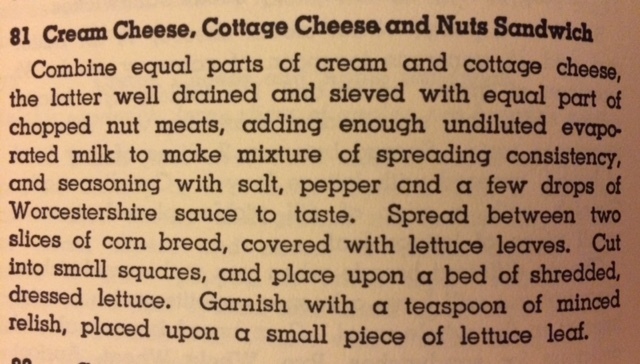 It’s my go-to sandwich. But not all are as… accepted.. as the BLT. Posted in Review, Weird Find and tagged Book, Cost, Gift, Lunch, Review, Sandwich, Twitter. Bookmark the permalink.